This artist's concept highlights the differences between a silicate-based ocean-filled planet similar to Earth (left) and a dry planet that is rich in carbon. Researchers say the odds are low that life as we know it, which requires liquid water, would thrive under the barren conditions of a carbon-based world. If scientists ever find a true diamond planet in an alien solar system, they shouldn't expect to see life teeming on its surface. The same carbon-rich conditions that might give rise to a so-called diamond planets could also create waterless environments too hostile to support life, new theoretical research shows. Though carbon is the main building block of life on Earth, it is relatively scarce in our solar system. Our sun is actually a quite carbon-poor star, and our home planet is comprised mostly of silicates, scientists said. But to imagine what a more carbon-based exoplanet system might look like, a group of researchers funded by NASA turned to theoretical models. 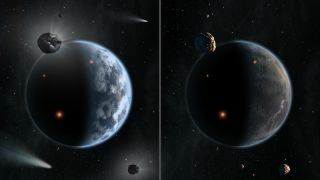 The team found that carbon-rich alien solar systems would likely lack the icy comets and asteroids thought to have given rise to Earth's oceans. These icy space rocks are thought to have originated far our in our solar system, past a boundary called the "snow line" before slamming into Earth and depositing water on its surface. But in the models of carbon-rich star systems, this water was nonexistent. "There's no snow beyond the snow line," Torrence Johnson of NASA's Jet Propulsion Laboratory in Pasadena, Calif., said in a statement. The results could influence how scientists view potentially habitable rocky planets like Earth that lurk outside of our solar system. Exoplanets in the "habitable zone" lie in an orbit around their star where temperatures would be warm enough for water to pool on the surface. But the chemical composition of the planet could influence whether or not liquid water is even a possibility for these words, the research suggests. "All rocky planets aren't created equal," Lunine said in a statement. "So-called diamond planets the size of Earth, if they exist, will look totally alien to us: lifeless, ocean-less desert worlds." The computer model results were published in the Astrophysical Journal last year. The research also was presented this month at the American Astronomical Society Division of Planetary Sciences meeting in Denver.